A monument to landscape architecture art of 19-20 centuries. In Ukraine is located in the town of Bila Tserkva in the Kiev region located on the Ros' river some 95 km (59.03 mi) south of the nation's capital Kiev. A monument to landscape architecture art of 19-20 centuries. In Ukraine is located in the town of Bila Tserkva in the Kiev region located on the Ros' river some 95 km (59.03 mi) south of the nation's capital Kiev. In 1302 the Kyvian Prince Yaroslav the Wise founded the town of Yurijev on the bank of the Ros River and build a stone cathedral on the top of the Castle Hill. People called this cathedral the White Church, hence the name of the town Bila Tserkva. In 1781, the Grand Hetman of Poland Francisk Branitskiy married the beauty Alexandra Engelgardt, a lady in waiting of Catherine the Great and a niece of Prince Potemkin. The couple started developing Bila Tserkva. The Cathedral of St. John the Baptist /1812, burial vault of the Branitskys, 1 Soborna Square where was raised on Castle Hill. 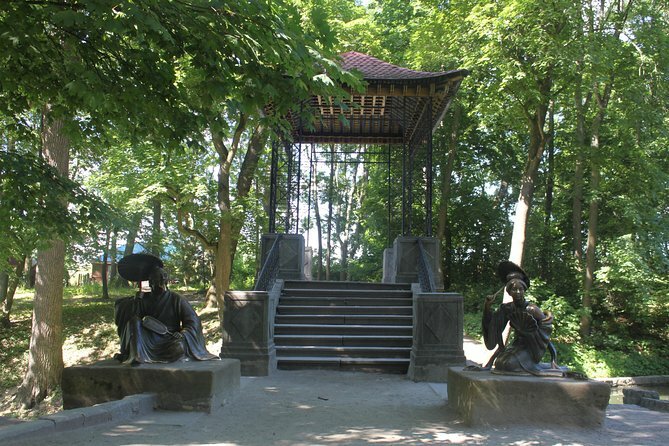 Branitsky founded a Dendropark and named it Alexandria in honor of his wife. Its development cost Branitsky 4 million roubles in gold. The park became one of the finest in Europe. The park became one of the finest in Europe. Except for the palace structures, it has been well preserved. The park’s area is 297 ha, with 2.240 species of trees, shrubs, and perennial grasses. The most popular park structure is the Echo Pavilion /1800/ with unique acoustics. The words of love softly whispered at one end of the colonnade easily fly over 34 meters and reach your beloved. 16 marble 19th centuries Statues, including gorgeous Three Graces /sc. A.Canova/ have presented in the park. Traveler's centrally located Hotel or Apartment in Kiev. Tour ends with the hotel drop-off. Transportation by private vehicle orminivan or minibus.